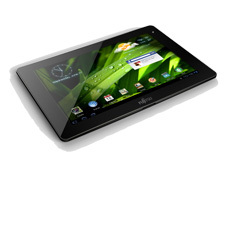 The Fujitsu STYLISTIC M532 Tablet is an Android tablet built for business users. It's powered by a Quadcore ARM-based NVIDIA® Tegra3 mobile processor T30S. But, it only has a microUSB port and a microSD card slot. Compared to the original Lenovo ThinkPad Tablet which had a full USB port and a full SD card slot, the Fujitsu STYLISTIC M532 Tablet doesn't have the ports or slots that a typical business executive may need. Then again, the STYLISTIC M532 is lighter and slimmer than the ThinkPad. The big question for me is: how will Android and iOS cater to the needs of business/enterprise customers once Windows 8 devices start rolling out this fall?